Your track has a unique number to identify it. 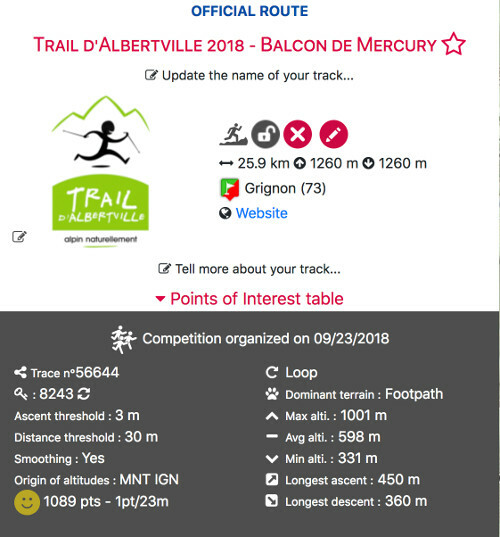 This number appears in the url of the track page, for example : https://tracedetrail.com/en/trace/trace/48462. The points of interest table gives you the distances, altitudes and ascent for intermediate points ; these points are defined by the author. Endurance criteria, on a 1 to 6 points scale. It is based on the number of effort points obtained mostly with distance and vertical gain (with the formula: distance (km) + vertical gain (m) / 100). 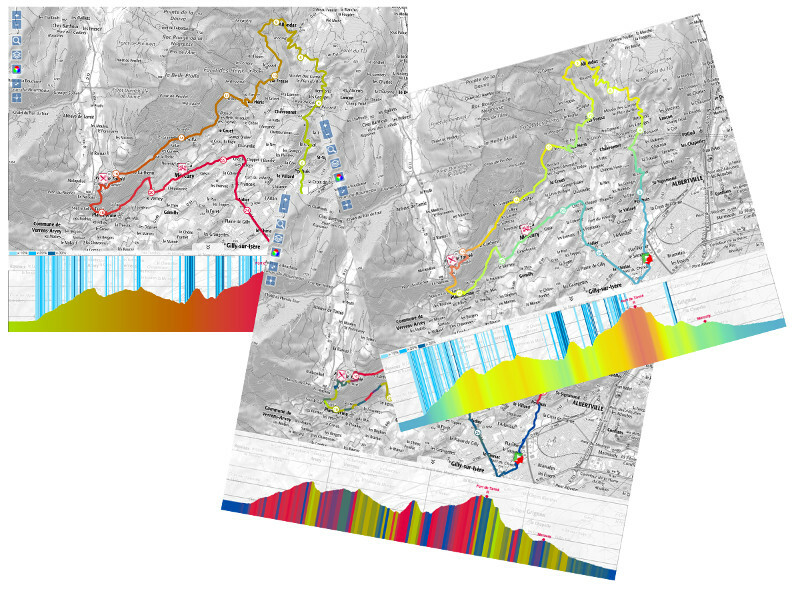 The Mountain level : it distinguishes the "Mountain" difficulty of a race on a 1 to 12 scale. We base our evaluation on impartial values as the percentage of slope, the longest continual ascent and the average altitude of the course. The Finisher criteria : it is calculated according to the limited time authorised by the organizer and concerns more particularly the slowest runners. It gives the Performance Index required to be able to finish the race within the time limit. By comparing the Finisher criteria to their own Performance Index, each runner will be able to judge their ability to finish the race within the time limit. Use the Shift key on your keyboard to draw the extent of your zoom and the Alt + Shift keys to rotate your map ! Your trace is displayed with a default basemap according to your status (guest, member, subscriber) and the location of your track. 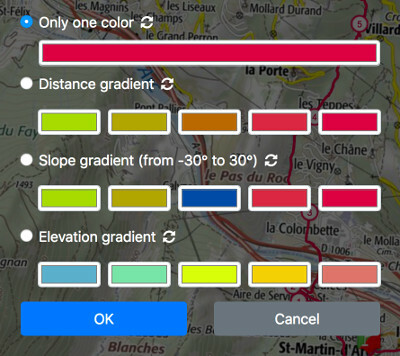 By displaying the layers switcher, you can choose another base map; some base maps are only available to members with a Trace de Trail subscription. 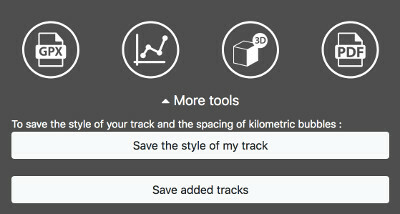 It's also in this layer switcher that you can customize the appearance of your track: spacing of the kilometric bubbles, line width, style (dashed) or color. For color, you can choose a solid color, but also a gradient according to the distance, the altitude or the slope. You can also use the button Add a track at the top of the layer swicther. 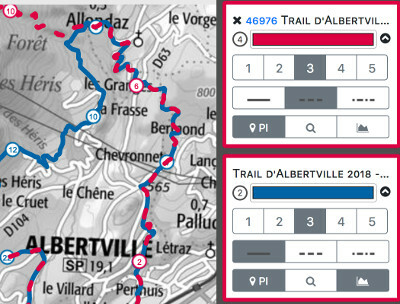 You can then choose from the nearby tracks, from your tracks, your favorite tracks or your last tracks. Finally, you can enter a trace number directly. All selected tracks will appear in the layer switcher and you can customize the appearance of each. 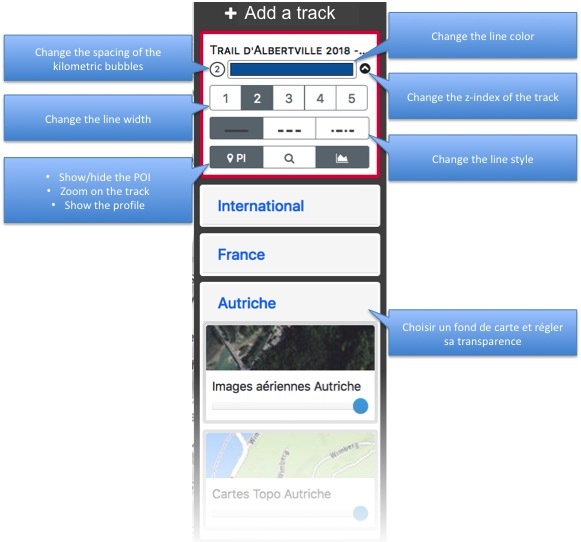 The owner of the track can use the button Save added tracks in the panel More tools so that the selected tracks are displayed automatically each time the page is loaded. If you have created variants for your track, they will also be displayed in the layer switcher. 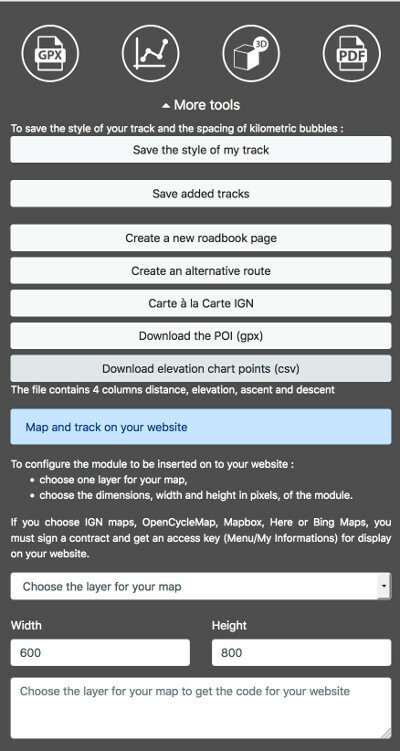 Other tools are accessible from the track page. Some of these tools will only be accessible to the owner of the trak and others will require a subscription.